Whether fresh or previously frozen, Dungeness crabs and blue crabs are a great meal to linger over. Flip a coin. Heads its Dungeness, tails its blue. We’re in either way. Some of the most memorable meals we’ve enjoyed were centered around freshly steamed or boiled crabs, good beer or wine, and a long, leisurely meal with just the two of us or with friends cracking and picking crabs. We prefer fresh crabs whenever we can get them. In South Carolina, there was a private dock on a saltwater cut through the marsh that could be counted on to produce blue crabs on incoming tides. And when I lived in Oregon, throwing out a couple of crab pots was a matter of course on salmon fishing trips. Because Dungeness populations are depressed in the parts of Alaska we frequent, their harvest isn’t currently permitted in those locales. So most of the crabs we’ve been getting are purchased already cooked, but we still heat them before serving. Our favorite way to boil-steam crabs is fairly simple. 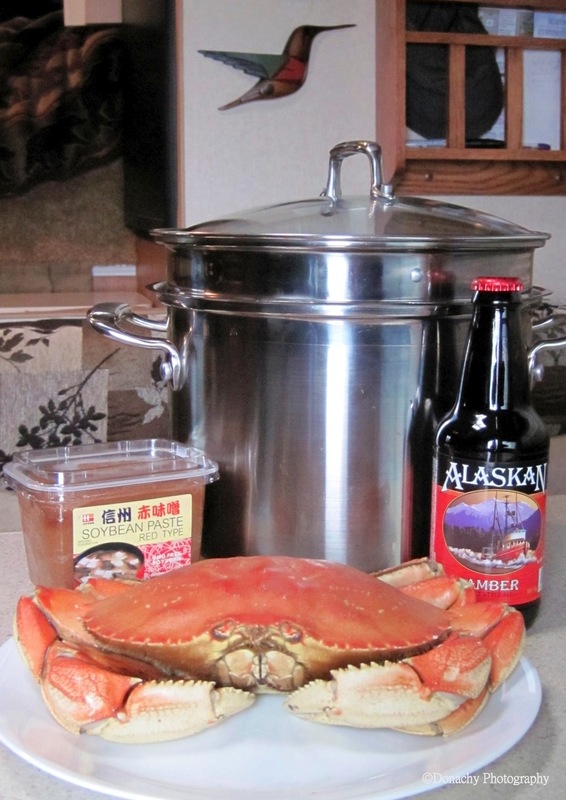 We start with about a half-bottle (6 – 8 ounces) of beer and 1 tablespoon of miso per Dungeness crab. Since more liquid than this is necessary, we add a cup of water or two. The idea is to ensure that there is enough liquid so that it doesn’t all boil off in the 12 minutes or so required to heat through a previously frozen Dungeness. For two crabs, add a 12-ounce bottle of beer, a little more miso, and, if necessary, a little more water. I usually don’t immerse the entire crab. This is because I’m frugal (cheap) and hate wasting beer. I boil-steam the crab on one side for a few minutes, then flip it and continue cooking it for a few minutes more. If I’m doing multiple crabs, I arrange them in the pot as best I can and rotate them once during the cooking – although this really may not be necessary. Previously cooked crabs are inevitably already plenty salty. The beer and miso bath gives them a mild sweetness. If you’re starting with fresh crabs, you might want to add some salt to the broth. A good rule of thumb is to steam fresh crabs for about 7 – 8 minutes per pound – which means a two-and-one-half pound crab needs about 20 minutes in the pot. One crab this side is usually plenty for the two of us, served with, say, a salad, fresh corn on the cob, and a loaf of crusty bread. Our favorite dipping sauce? Melted butter, olive oil, garlic, lemon and soy sauce. For two people, melt about 6 tablespoons of butter. Add a clove of minced garlic and sauté it for a minute or so. Then add 1 tablespoon of olive oil, the juice from half a lemon, and 1 tablespoon of soy sauce. A slice or two from a really great loaf of bread can be used to sop up any remaining sauce. Crab goes great with a wide range of beers or a buttery Chardonnay. YUM! And I love seeing that little hummingbird because it tells me you made this in the camper! Great tips on how to prepare the crab. It’s making me hungry!